Center for History Open. After its annual winter hiatus, the North Manchester Center for History is open again during its regular hours. The museum is open Monday through Friday from 10 a.m. to 4 p.m. for visitors and for those who wish to donate objects to the NMHS collection. The office continues to be open on weekdays as well. Special arrangements for groups or meetings can be made by calling the Center at 982-0672. Thomas Marshall House Open. On April 4, the Thomas Marshall House begins its regular open hours the first Saturday of each month. From 1 p.m. to 4 p.m., docents will tell visitors about the Marshall family and conduct them on a tour of the restored 1850’s house. Traveling Exhibit. An exhibit from the Indiana Historical Society will be on display at the Center for History from April 19 through May 22. The Golden Age: Indiana Literature, 1880-1920 is drawn from collections at the IHS, Indiana State Library and Indiana University’s Lilly Library. The NM Center for History hosts three IHS exhibits each year. Watch for other traveling exhibits in July and October. Tour. The NMHS joins with Shepherd Center to sponsor two excursions each year. The next one heads to upper Michigan June 18 – 20, 2014. Highlights include a stay at the Thunder Bay Resort, tour of the Soo Locks in Sault Ste. Saint Marie, and a visit to the horticultural gardens at Michigan State University in Lansing. The tours are very reasonably priced, tourist-friendly, and highly rated by those who took part in past tours. Just a few spaces remain open; contact Bernie Ferringer, the tour coordinator, at 260-982-8734 or 260-901-0113 to make a reservation. 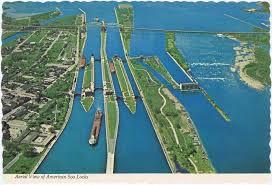 Soo Locks in Sault Ste. Marie. Bicentennial Endorsement. The North Manchester Historical Society is pleased to be one of the first organizations in Indiana to receive an endorsement from the 2016 Indiana Bicentennial Commission. Groups from all over the state are encouraged to submit projects that are culturally inclusive, create a legacy for the future, celebratory and/or engage and inspire youths and young adults. Thirty-one organizations have received the endorsement so far, and others will be endorsed over the next two years. The NMHS endorsed project is a video with the working title North Manchester Video History, Yesterday and Today. Inspired by a 1938 movie about North Manchester, the society is in the middle of filming interviews with North Manchester residents. In addition to footage used for the film, hours of interviews will be added to the NMHS video archives for future research. It’s a treasure trove of information for future historians. Further Bicentennial information can be found at www.indiana2016.org.